A masterpiece of German Renaissance Art (1430-1580), Albrecht Durer's still life of A Young Hare is one of the first nature studies to constitute a painting in its own right. Like his later work Great Piece of Turf (1503, Albertina), the animal is painted with in a hyperrealist manner, just like a photograph. The watercolour - also known as The Field Hare, or The Wild Hare - exemplifies the detailed realism of the Northern Renaissance: a style which originated in early 15th century Flemish painting, embodied by Jan van Eyck (1390-1441). Durer himself learned drawing and illustration from the Nuremberg artist Michael Wolgemut (1434-1519), although he is best-known for his printmaking - notably woodcuts and engraving, which he learned from his goldsmith-trained father. He is also noted for his innovative self-portraits - see, for instance, Self Portrait with Fur Collar (1500) - as well as his fascination for landscape, plants and animals, which he developed during his travels in Germany and Italy. How familiar he was with the Danube School in southern Germany, is unclear, but he produced a quantity of watercolour landscape painting during the 1490s, including Pond in the Woods (1495, British Museum). A Young Hare was Durer's animal masterwork, although we still do not know whether he sketched the animal in the wild and then completed it indoors, or whether he copied it from life in his studio. Some art critics claim that the reflection of a window frame in the hare's eye indicates the latter, but this reflection is a technique that he often used to add extra vitality to his subjects. 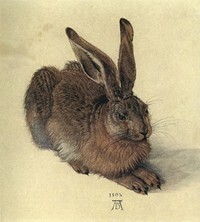 In reality, Durer probably used a stuffed hare to paint from, after making sketch notes in the wild. Certainly the scientific detail is impressive, but Durer's affinity for texture and use of light to add life to his subject is even more impressive. Not only does he manage to highlight the ears and pick out the tip of each hair across the body, but also he imbues the animal with a warm golden light that gives life to the eye. Durer first sketched the hare and then applied a brown wash. Next, he built up the fur using a mixture of dark and light brushstrokes in both watercolour and bodycolour. He then added a few details including the whiskers and the reflection of the window in the animal's eye. Once he finished the watercolour panting, he then applied some opaque gouache, painting groups of lines to mimic the lie of the fur. Finally he added white highlights to give the animal its three-dimensional appearance. Durer paid at least two visits to Italy during which he absorbed much of the humanism and new techniques of the Italian Renaissance, especially the Renaissance in Venice and the north of Italy. As a result, he was able to synthesize characteristics of Northern or older medieval painting and the new Renaissance art being developed in Florence. This, together with the sheer variety and quality of his work, as well as his theoretical writings, fully justifies his reputation as one of the best artists in the history of art.  Descent From the Cross (1435-40) Prado, Madrid.  For the meaning of other Northern Renaissance watercolours, see: Homepage.